And my husband does not play around when it comes to pizza. 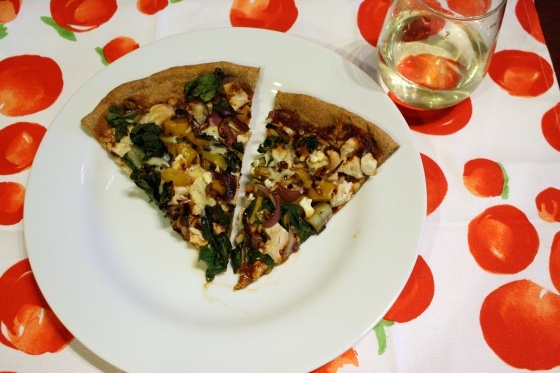 He later told me that when I first mentioned making barbecue chicken pizza for dinner, he thought back to how he had never had a barbecue pizza that he actually liked. 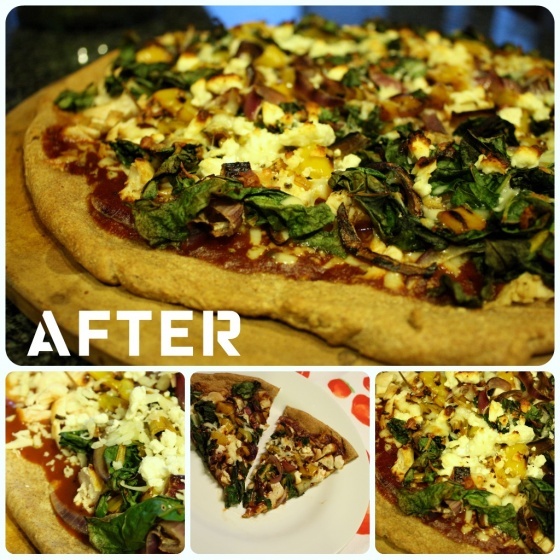 That all changed last night when he told me that this pizza was incredible and that I had to make it again soon. Preheat oven to 425 degrees F. Sprinkle chicken generously with salt and pepper and cook on medium high heat, in 1 tsp. evoo until cooked thoroughly. Remove chicken from pan and set on a plate to cool. In the same pan, add the last tsp. of evoo and saute all of the veggies except the chard. 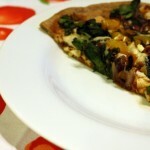 When the onions start to soften, add the chard and toss with a spatula to turn over all the veggies. Meanwhile, press dough out onto an oiled pan or pizza stone. Pour barbecue sauce into the center of the dough and use the bottom of a spoon to spread the sauce evenly across the dough. Add more sauce if desire. Layer half of the pepper jack cheese on top of the sauce. Chop the chicken into bite size pieces and sprinkle evenly over the cheese. Spread the veggies evenly over the chicken. 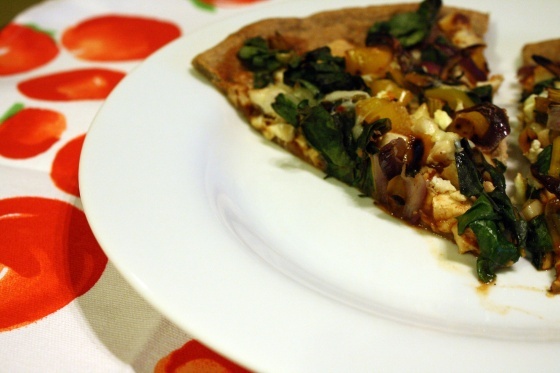 Finally, layer the additional pepper jack and feta cheese on top of the entire pizza. Bake for 20 minutes or until your crust is golden brown. Then, try to stop at only two pieces. I dare you to. Brad was right. This pizza is a keeper. 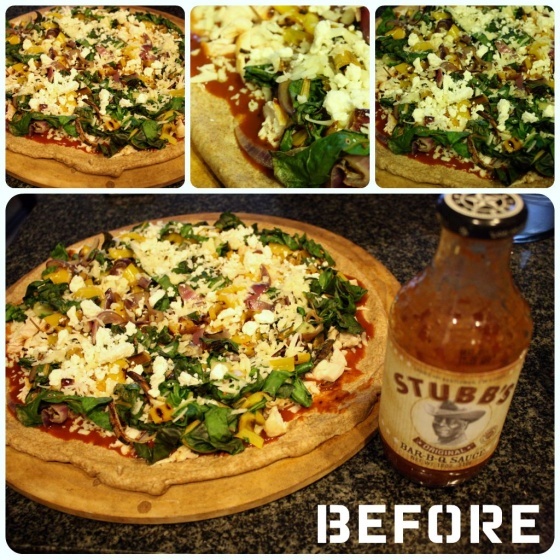 The combination of Stubb’s barbecue sauce, which is a bit spicy, plus the earthiness of the chard, and the creaminess of the cheese bring so many delicious and complex flavors up in this pizza. The toppings are out of control for this size of a pizza so it’s almost like you’re eating a cheese stir-fry with a crust. It’s even better the next day, like most pizzas. And now, it’s time for random and weird facts about Rascal. 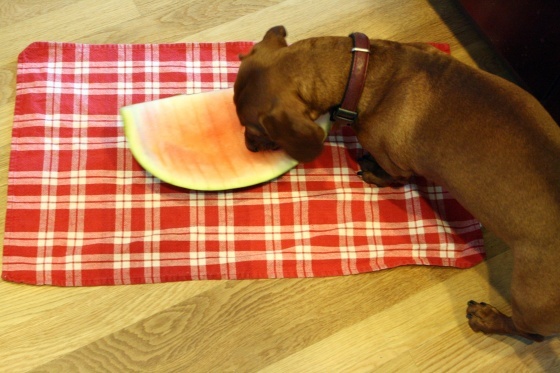 Fact #1: Rascal likes to help finish off a watermelon. He licks the juice off first, then tries to scrape the last little bit of flesh off with his teeth. I stop him before he gets to the rind, but I’m pretty sure he would eat the entire thing if I let him. 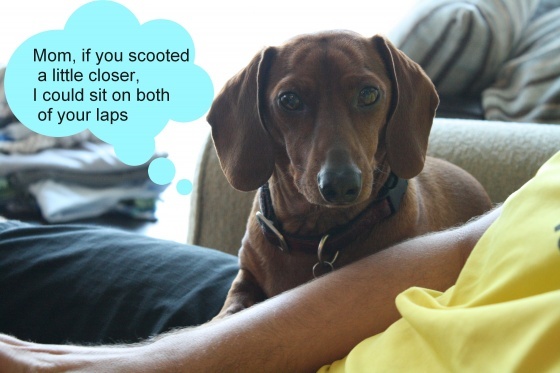 Fact #2: Even when Rascal chooses to sit on Brad’s lap, he stares longingly at me the entire time. He’s so weird. I’m pretty sure he wants me to sit close to Brad so that he can lay across both of our laps. He really is such a needy dog. So I readily accept his weirdness. What’s the weirdest thing you dog, cat, gerbil, or goldfish does? What’s the best pizza you’ve ever had? I had a slice in Corniglia, Italy that was slathered in pesto, which was ahhhhmazing.